As I drove my kids to school this morning on a beautiful spring-like Los Angeles day, the mood in the car turned foreboding as we listened to the BBC reports about the 8.9 earthquake that struck northern Japan. It was the most severe earthquake to hit Japan in recorded history and 1,000 times more powerful than the earthquake that struck Haiti last year. The West Coast and Alaska Tsunami Center issued a warning for California because of fears of a tsunami traveling east. I was happy we were leaving early and getting a quick before- school-breakfast at an (inland) bakery. It was now 7:18 a.m. We seemed ok. The first waves, if there were any, were predicted to hit California at 8:30 a.m. But we wondered if we were exposed: We were driving south down the Pacific Coast Highway and to our immediate right was the ocean. The sea looked calm and the breaks in the ocean appeared normal, but I knew my kids' ominous thoughts about it. My seven-year-old son asked if anyone in Japan had died. Yes, I told him, people had perished. He also wondered if we were in the tsunami's path. We live near the beach and we drive by a sign every day that says "Leaving Tsunami Hazard Zone" and so my children are aware that some sort of danger can befall the Santa Monica area, a community that is familiar with all sorts of natural disasters, be it wild fires, mudslides, or earthquakes. The only natural disaster that seems to have missed Los Angeles, thus far, is a tsunami. Living in California means living in the "ring of fire," the Pacific Ocean basin that is the home to the majority of the world's earthquakes. I have experienced my share of shakers, including the San Francisco Loma Prieta quake of 1989 and the Los Angeles Northridge quake of 1994. I remember the psychological impact of the Los Angeles quake, in which people were afraid to go back into their homes and slept in parks instead. It took several months to calm nerves, and some of my friends threatened to move away from the state. In the interviews I heard from Japan, I could hear the fear  brought about by uncertainty  in the voices. But there was also resilience, surprising given that the energy of the Japanese quake was the equivalent of 30 of the 1906 San Francisco earthquake. according to Dave Applegate, Senior Science Advisor for Earthquakes and Geologic Hazards, U.S. Geological Survey. Applegate told some journalists on a conference call this morning that the quake was caused by significant rupture (180 miles long and 50 miles across) of the earth's crust. All reports said the Japanese were as prepared as anyone in the world. Applegate added, "Our lessons, from Haiti, from Chile, from Christchurch is that earthquakes don't come with a warning." This made me, momentarily at least, question where I have chosen to live. Even after the National Weather Service issued a warning, it was tempting to go to the beach. My father is a geologist and I am not unaware of the dangers of moving tectonic plates, but Japan, after all, is 5,500 miles away. After dropping off my children at school, I went to the beach by Santa Monica. On the car radio, I listened to reports that northern California, particularly the area around Santa Cruz, had experienced damage to boats, marines and coastal roads. In San Francisco area beaches had been closed as a precaution. In Southern California, news reports out of Ventura County said water had receded  one sign of an impending tsunami  and the waves were bigger than normal. But, overall, the damage was light. The ocean could be hazardous for up to 12 hours, but there seemed to be a lack of fear here in California. 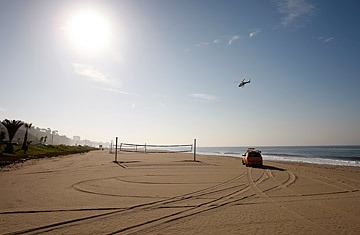 The Santa Monica beach and beaches in Los Angeles County remained open. Representatives from federal agencies gave warnings, but, of course, the cautions didn't discourage beach-goes and surfers who were getting an early start on the weekend. I looked across the Pacific, through a thin layer of smog, and imagined a surge of water coming toward me. But it felt unlikely that it would happen today.